Since it's Throw Back Thursday, I'm throwing it back with a classic from the film library, a certified Fresh on Rotten Tomatoes, blast from the past. Too bad movie theaters don't do a throw-back Thursday special; the price of a movie ticket 20 years ago was about $4.35; movie tix have been going up ever since. Twenty years. 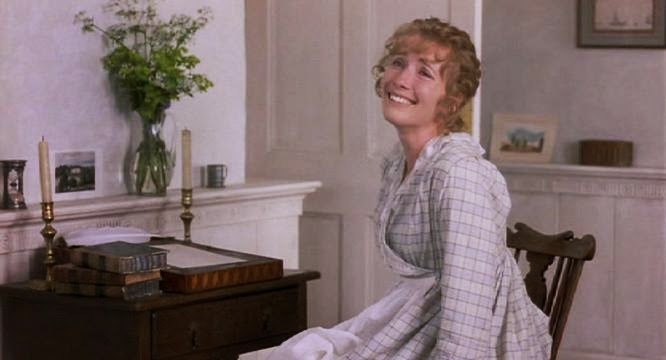 That's how long it's been since Emma Thompson dazzled the critics with her writing skills in her Oscar-winning adaptation of Jane Austen's Sense and Sensibility. Kate Winslet wouldn't even meet Leo and fall in love as Rose in Titanic for a couple of years yet. Hugh Grant was in the middle of finding his charming blinking self —he'd made Four Weddings and a Funeral the year before, but it would be another 5 years before he shot Notting Hill and Bridget Jones Diary. Alan Rickman was, well, he was already Rickman, the oft-times villain with the slurry, slightly sleazy delivery. 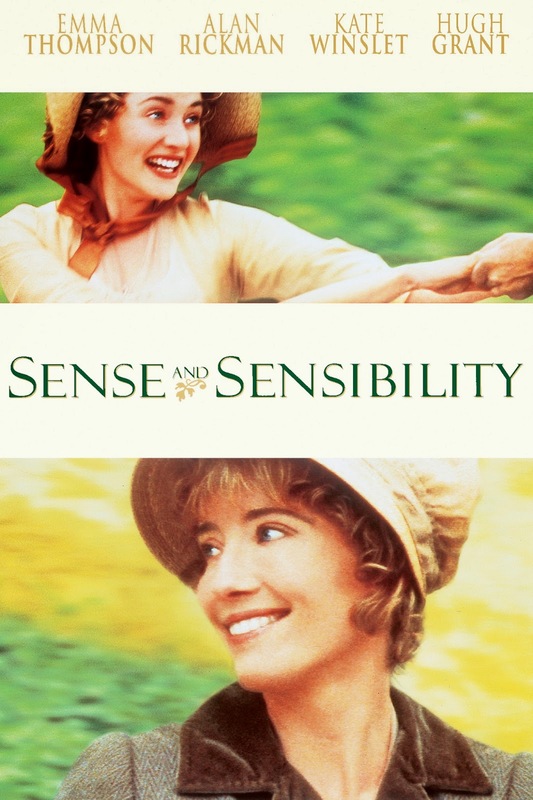 While Thompson's screenplay won the film's only Oscar, Sense and Sensibility received seven nominations in all, including Best Picture, Best Cinematography, and Best Dramatic Score by Patrick Doyle. Thompson and Kate Winslet were nominated for Best Actress and Best Supporting Actress and yes, the period drama was also nominated for Best Costume Design. Bizarrely the film's director, Ang Lee, was ignored. Cuz all that amazing stuff happened and he just happened to be standing there. Right. Anyway Lee knows living well is the best revenge; making the movies he wants to make. That's sweet revenge. Oh, and he's also won the Oscar twice since, for Brokeback Mountain and the beautiful Life of Pi. Thompson, in case you didn't know, wrote the script for the upcoming Effie Gray in which she co-stars with Dakota Fanning. Effie Gray is not based on a book so that's all I'm contractually allowed to say. The costume designer, Jenny Beavan, working with John Bright, lost to James Acheson for Restoration, a film I have never, ever heard of. Beavan is one of those genius Brit costume designers, a 9 time Oscar nominee for a host of glorious period pictures dating back to the late 1970's including The King's Speech, Gosford Park, Anna and the King, Howard's End, The Remains of the Day and A Room with a View for which she won the Oscar back in 1987. 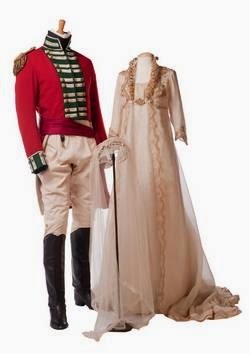 Beavan could get another nomination for Child 44, the upcoming Tom Hardy, Noomi Rapace, Gary Oldman movie based on the Tom Rob Smith best-seller we talked about yesterday but it will be difficult for anyone to beat out Sandy Powell, the costume designer for Cinderella. Powell —yes, also British—is a ten time nominee, has won three times —for The Young Victoria, The Aviator and Shakespeare in Love—and what she's done with Cate Blanchett's Cinderella look isn't just spectacular; it's an innovative re-imagaining of what could be just another lush period piece. But I digress, boy do I digress! 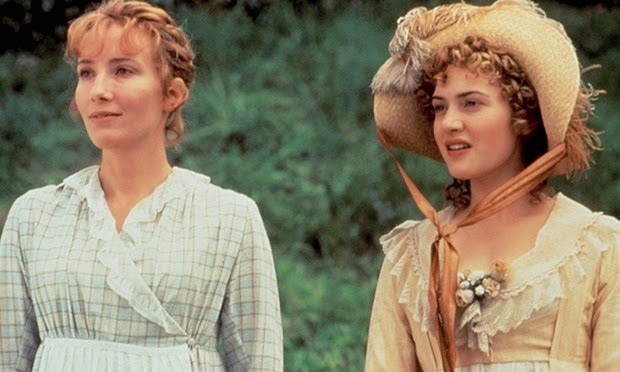 "this film version of Jane Austen's classic 1811 novel stars Emma Thompson as Elinor Dashwood. 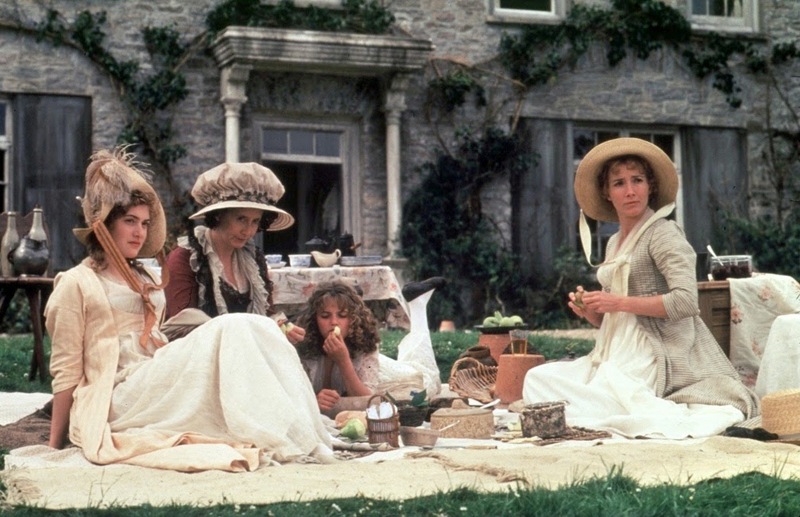 With her mother and sisters, Elinor struggles financially after the death of her father, who bequeathed the Dashwood estate to his oafish son by an earlier marriage. 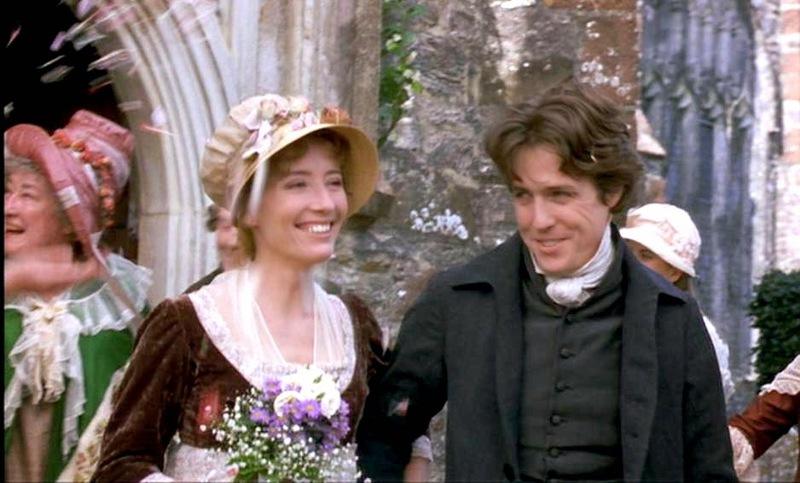 While sorting out the family's affairs, the shy, self-sacrificing Elinor secretly falls for her stepbrother-in-law, Edward Ferrars (Hugh Grant), a sensitive, well-educated bachelor who cannot court her because of his foolhardy youthful engagement to the greedy Lucy Steele (Imogen Stubbs). 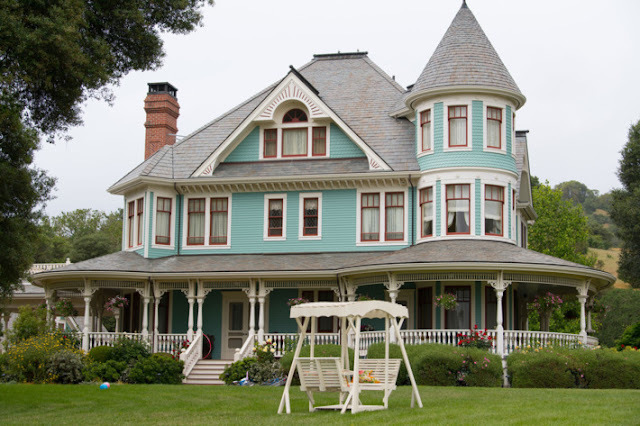 The grateful Dashwoods are offered a modest country home by family friends, which they accept. Once relocated, Elinor's brash, spirited sister Marianne (Kate Winslet) falls for a dashing local, John Willoughby (Greg Wise), a womanizer who nevertheless seems to share her affections. 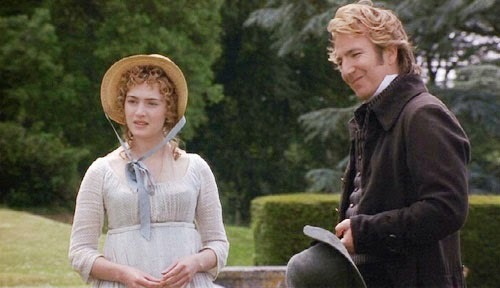 A prominent neighbor, Colonel Brandon (Alan Rickman), also falls in love with Marianne, but she is oblivious to the older man's affections. Eventually, Willoughby fails Marianne, breaking her heart, until she realizes Brandon's feelings. When Edward's family disowns him, Lucy marries his brother instead, leaving him free to pursue an exultant Elinor. " 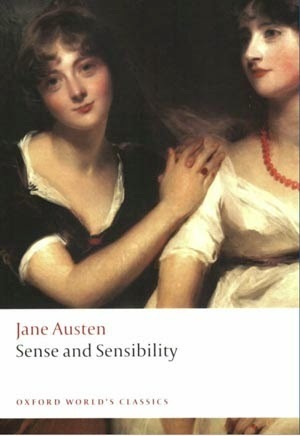 ... you can stream Sense and Sensibility on Amazon (I so wish I had money in Amazon!) VUDU and GooglePlay. 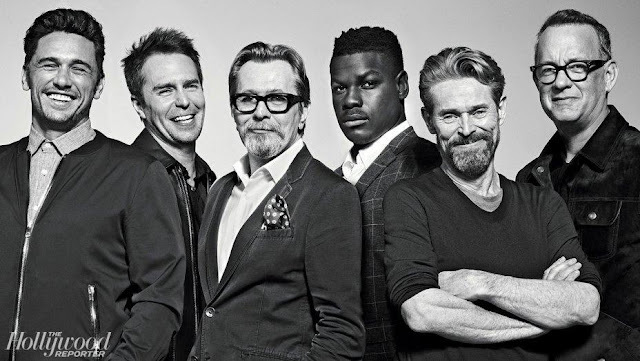 The only thing it's missing is Colin Firth. Greg Wise will have to do; Wise is the dashing and dastardly Willoughby. He also happens to be in Thompson's Effie Gray.